Matrx Stabilite Seat Cushion is manufactured by Invacare to provide chair and seat support. Invacare is one of the leading medical supply companies in the world. The Invacare Stabilite Chair Cushion is designed to provide pelvic stability and leg positioning for patients with postural asymmetry. The Stabilite Seat Cushion comes with a patent pending ThinAir liner, a unique comfort layer that assists in redistributing peak pressures away from bony prominences. The Stabilite Chair Cushion is a great choice for geriatric or CVA clients. 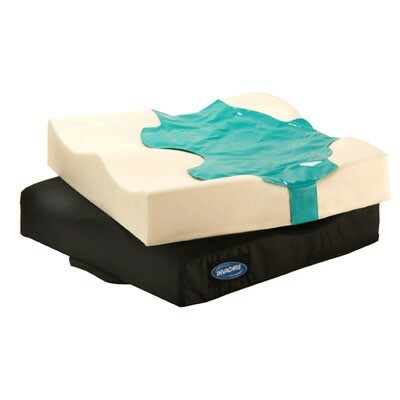 Positioning foam base supports the pelvis and thighs; helps to prevent adduction and internal rotation. Two contour options: GENTLE & MAX..
ThinAir Liner helps reduce shear. Weight Capacity: 15" to 20" - 250 lbs. Invacare Matrx Stabilite Cushion Warranty: 2 years.